2. 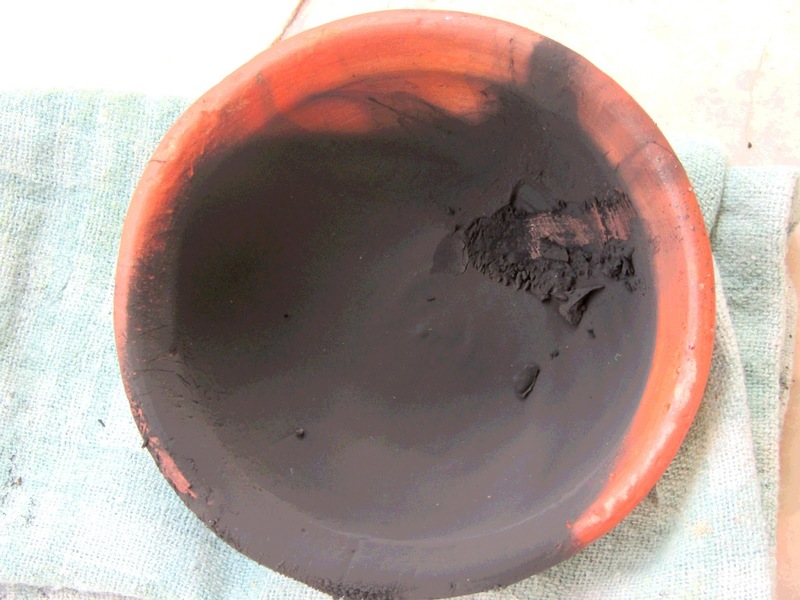 A clay candle (diya) or a steel bowl (katori). Place a clay candle/steel bowl on safe surface. Add two stones/bricks from each side. 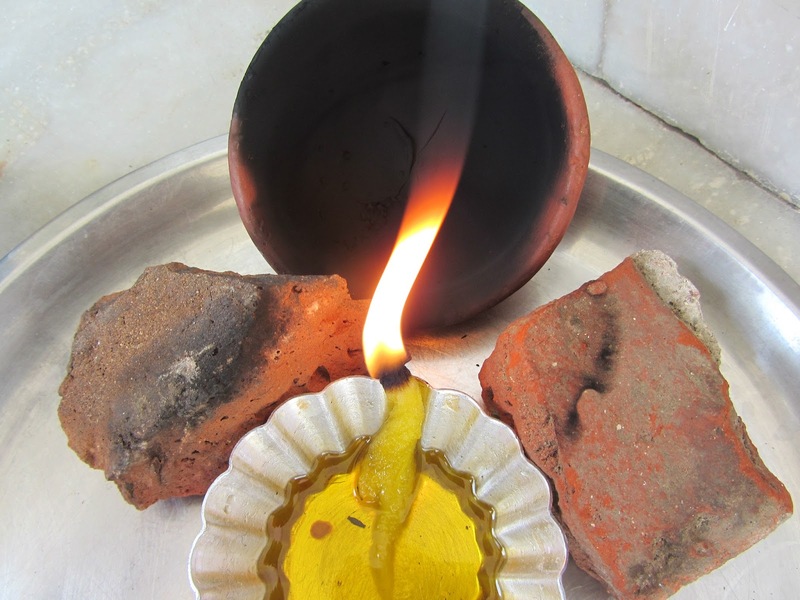 Pour some mustard oil in the clay candle and add a long piece of rolled cotton in it. Light it using matches and cover it with the clay bowl. Use the two stones/bricks as a base. Now let it be there for 20-40 minutes. Using a cloth, carefully turn the clay bow. You will see that it has been covered in black coal like powder. This is the soot. Now, if you like, you can take out a scoop of soot and place it in another bowl. 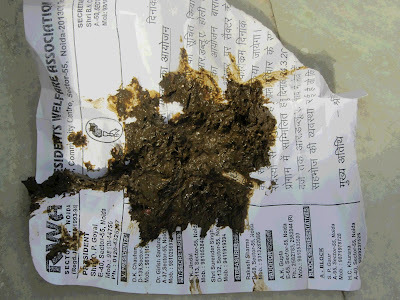 Mix some cow dung in it and some water. The other way is to mix soot with some hot water and gum (colorless liquid glue paste). The third way is to mix soot with some hot resin. Dry resin, needs to be melted in hot water. The cow dung paint that we made didn't have a very dark black color but it was a satisfying dark color to paint with. The soot with gum turned out to be a really black color. Gum and soot don't get blended easily so it might take about 10 minutes to blend it properly. Also it's better to use very little glue because if drawing with a nib, it can produce lines that will not be as dark (the glue will separate from water). Very good. I have a question, you say that the resin separates from the water. If I use the resin/water/soot mixture will it seperate shortly after it is applied to the cloth or over time? Thanks for your time. Hi! I haven't tried using resin yet. I did buy it because I was told that it can be used as binder. I don't think I wrote that resin will separate from water. I meant to say that soot separates from water and that's why we should use resin in order to bind them. If the hot water is used, I don't think it will separate. But I haven't tried this way yet, I simply did it with water and soot.